Vienna, OH, July 2018 – Solutions providers need to have their finger on the pulse of their customers’ pain points. For many warehouse managers, that means a way to prevent their pallets and product from being destroyed when colliding with a fork truck. 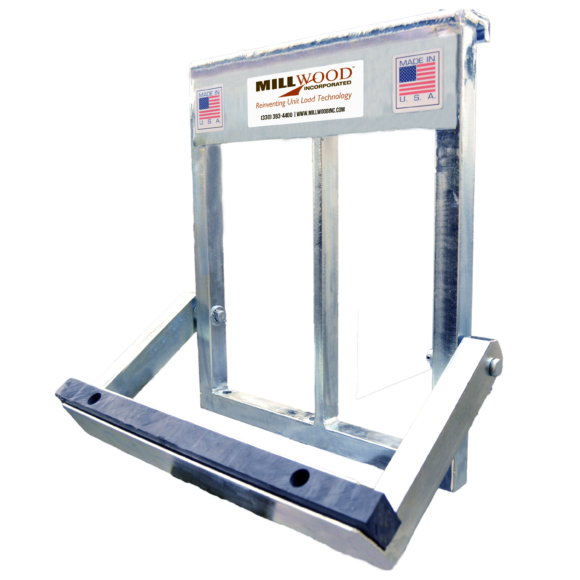 Millwood, Inc. is offering relief in the form of our newest product, the Product Protector. The Product Protector is a solid steel frame with a rubber bumper that attaches to a forklift. Instead of destroying a pallet when a fork truck moves too hard or fast, the Product Protector impacts the stringer before the deck boards are damaged by the fork tine heel. The device is small, weighing only 37 pounds and measuring 16.25 inches wide. Don’t let the size fool you though; it can easily sustain a 30,000 pound impact without failure. The zinc coating on the solid steel prevents corrosion, ensuring that the device is both economically and fiscally sustainable. “The Product Protector makes pallet lead board damage a thing of the past. Reduced pallet damage means reduced product damage. There is nothing on the market better today,” said David Haubert, regional sales manager – Midwest region.The Product Protector can be purchased through your regional sales manager or online at www.libertydirect.com.